Short Bio: Best remembered as the author of “Catcher in the Rye” Salinger was drafted into the Army, where he saw combat with the 12th Infantry Regiment, 4th Infantry Division. He was active at Utah Beach on D-Day and in the Battle of the Bulge. When Britain and France went to war with Germany in 1939, Americans were divided about offering military aid, and the debate over the U.S. joining the war was even more heated. It wasn’t until two years later when the Japanese bombed Pearl Harbor and Germany declared war against the U.S., that Americans officially entered the conflict. As America’s industries retooled their factories from manufacturing domestic goods to producing tanks, planes, ships, guns, and ammunition, serious concerns arose about the vulnerability of America’s long coastline to infiltration by enemy saboteurs. To address the concern, the War Departments launched a program to train canines as sentry dogs for the purpose of guarding our country’s factories, transportation lines, and our borders. A goal to train 10,000 dogs was established and War Dog Training Centers were built and the procuring of suitable dogs began in earnest. 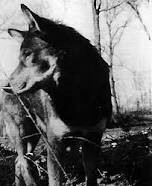 But finding enough dog candidates suitable to train as sentry and scout dogs was more difficult than thought. To address the challenge of not being able to acquire enough suitable dogs in such a short amount of time, the military put out the word for civilians to donate their dogs. 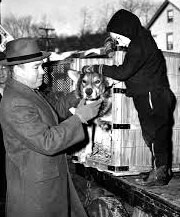 Eager to aid the war effort, thousands of patriotic pet owners across America responded by donating their pets. 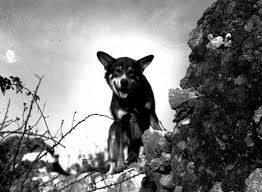 Chips – a German shepherd, collies, husky mix – was one of those dogs. Everyone in the Wren family knew that Chips was a special dog. Just how special, though, it would take a war to discover. Chips was trained as a sentry dog at the War Dog Training Center in Front Royal, Virginia. Chips, and his handler Pvt. John P. Rowell of Arkansas were assigned to the 3d Military Police Platoon, 3d Infantry Division and served in North Africa, Italy, France, Germany and Sicily with Lt. Gen. George Patton’s Seventh Army. In the predawn of July 10, 1943, the 3rd Infantry Division under the command of Maj. Gen. Lucian Truscott landed on the shores of southern of Sicily near Licata in Operation Husky. Among the troops that hit the beach was the 3rd Military Police Platoon, 30th Infantry Regiment were Chips and Rowell. As dawn broke, the platoon was working its way inland when a machine gun hidden in what appeared to be a nearby peasant hut opened fire. Rowell and the rest of the platoon immediately hit the ground. But Chips broke free from Rowell and snarling, raced into the hut. Rowell later said, “Then there was an awful lot of noise and the firing stopped.” The platoon members then saw one injured Italian Soldier come out with Chips at his throat. Rowell called him off before he could kill the man. Moments later, three badly bitten Italian Soldiers emerged from the hut with their hands over the heads, all shepherded by a very determined Chips. Chips was also wounded, suffering powder burns and a scalp wound from the pistol fired at close range. Medic treated Chips and released him to Rowell later that day. That night, while on guard duty, Chips alerted Rowell of an infiltration attempt by ten Italian Soldiers. Together they captured all ten. After the Battle of Salerno in which Chips and Rowell had taken part, General Dwight Eisenhower came to congratulate the unit, and he bent to pet Chips. 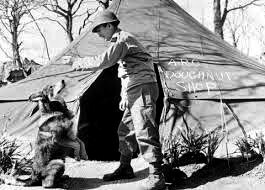 Unfortunately, only the handler is to touch a War Dog, and so Chips responded as he was trained, he nipped Ike. Another time, Chips alerted to an impending ambush. Then, with a phone cable attached to his collar, Chips ran back to base, dodging gunfire so the endangered platoon could establish a communications line and ask for the backup they so desperately needed. Chips was a true hero. He was awarded a Silver Star for valor and a Purple Heart for his wounds. The newspapers back home heralded his exploits. Unfortunately, the press attracted the attention of the William Thomas, Commander of the Order of the Purple Heart. He angrily wrote letters to the president, secretary of war, and adjutant general of the U.S. Army protesting that the Purple Heart was a decoration for humans, not animals. Congress then got into the act. After a debate lasting three months, it was decided no more decorations were to be awarded to non-humans adding “appropriate citations may be published in unit general orders.” This meant that at least they would receive honorable discharges. The debate surrounding the giving of medals to military dogs not only led to the denying dogs the right to recognition for their efforts but also paved the way for the military to classify them as “equipment” – a classification that would cost them dearly. 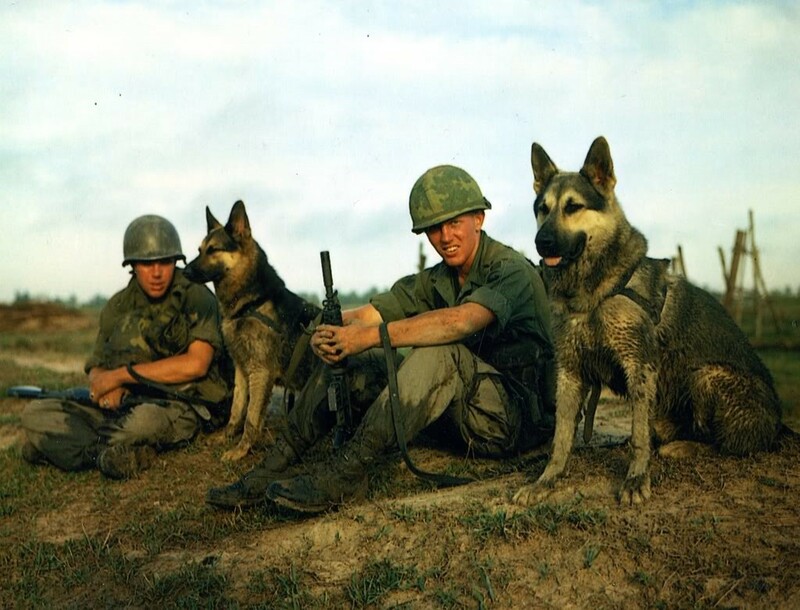 When the U.S. pulled out of Vietnam, the military dogs were classified as “equipment” and left behind. Despite earnest efforts to bring the dogs’ home, the order to abandon them was firm. Over 4,000 dogs served in Vietnam, many sacrificing their lives. They saved thousands of American Soldiers from death or injury. Stories vary as to what became of these valiant canines, but one thing is known to a certainty is that they shared all 24/7 with their handler. These dogs gave their full measure of devotion – whatever the danger – but they did not get to share the freedom of coming home. In addition to patrol duty with the infantry, Chips was posted to sentry duty in Casablanca during the January 1943 Roosevelt-Churchill Conference. Through eight campaigns across Europe, Chips was also a POW guard and tank guard dog. Chips spent 3 1/2 years in the Army. He served in North Africa, Italy, France and elsewhere in Europe. He met President Franklin D. Roosevelt, British Prime Minister Winston Churchill and General Dwight D. Eisenhower. His family had requested his return after service, so in the fall of 1945, he was taken back to Front Royal where he was retrained so that he could go back to his family. In December 1945, Chips was discharged from the military and returned home to the Wren family. He was accompanied by six reporters and photographers who wanted to cover the story. Mr. and Mrs. Wren and son Johnny, who was only a baby when Chips left, met Chips at the train. Sadly, Chips died just seven months later due to complications from injuries sustained in the war. He was just six years old. Chips is buried in The Peaceable Kingdom Pet Cemetery in Hartsdale, New York. There are many inspiring pets and animals in the world, but military working dogs have a special place in the hearts of many. In today’s patriotic political climate and the constant presence of war in our lives, we have a special reverence and respect for our Soldiers and there’s nothing like seeing a Soldier and his dog together to instill that feeling of pride, and possibly bring out a tear or two. Our Soldiers overseas today often have specially trained canine troops along with them. These dogs are well trained and function as part of the unit, doing what they have been trained to do, but the deep devotion between the handlers and their dogs is just as intense as the feeling of family that all Soldiers have toward one another. Photos emerge online showing our Soldiers in full battle gear with their dogs’ right alongside them. The dogs that are our Soldier’s friends aren’t always fellow Soldiers, either. The troops in Iraq and Afghanistan have rescued and cared for many stray dogs, and programs such as the Puppy Rescue Mission were created to help bring these adopted dogs home with their Soldiers. The tall man in an immaculate business suit looked across the crowded classroom at more than a hundred young faces. He was an imposing figure, over six feet tall and broad of shoulder. Yet he spoke with a quiet gentleness that captivated the children. At the back of the room stood an impatient cameraman from the local TV station. He had come to interview a rare hero, a living Medal of Honor recipient. It seemed, however, that Peter Lemon was more interested in talking to the children than in talking to the camera. And he wasn’t even talking about himself or his own heroic actions decades earlier. Instead, the hero, pausing from time to time to compose himself, talked of three friends who had died the night of his action. 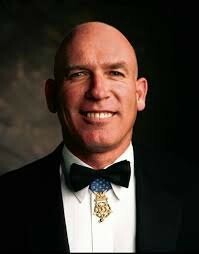 On that spring day in 1993, there were only 204 living Americans authorized to wear the Medal of Honor. Mr. Lemon was one of them, yet he had shown up in business attire, no Medal draped around his neck. The cameraman tried not to show either his impatience or his disappointment for it would not have mattered. Pete Lemon wasn’t seeking publicity, he was finding a “mission.” When the presentation came to a close Mr. Lemon invited the children to ask questions. “What does the Medal of Honor look like?” asked one student. “Here, I’ll show you,” Mr. Lemon replied as he withdrew a blue award case from his pocket. He took the Medal from the case and passed it out to the children to touch and hold. Everyone else in the room seemed equally surprised at the ease with which Mr. Lemon allowed one of our Nation’s rarest treasures to pass from hand to hand. Mr. Lemon must have read our thoughts for he quickly stated, “What good is it to have this Medal if you can’t share it.” Few in the audience that day realized what a major step that event was for Pete Lemon. 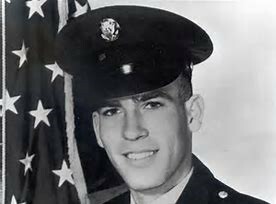 For him becoming a Medal of Honor recipient began after receiving his award, not in the moments of terror and valor that precipitated it on April 1, 1970. Peter Lemon was 19 years old, exhausted, scared, and fighting for his life. His body was bleeding from numerous shrapnel wounds in his head, back, and neck. These had been inflicted by an enemy mortar that had exploded near him earlier. Specialist 4 Lemon was fortunate. That same mortar round had literally vaporized one of his close friends and fellow soldiers. 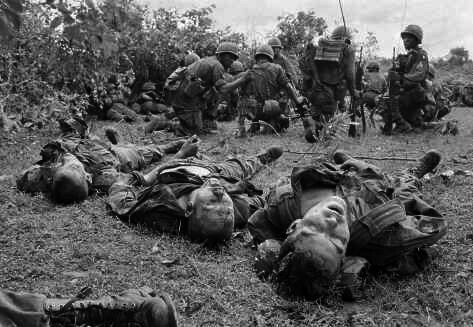 For more than three hours the battle had raged at Fire Support Base Illingworth, one of two small American outposts in Tay Ninh Province. Pete and his 18-man platoon had just returned from another recon patrol hoping to get a good night’s rest. But on this night there was no sleep to be found. Close to 400 enemy soldiers swarmed the small American outpost, and they had chosen the area of the perimeter defended by Pete’s Platoon as their point of attack. Already the young soldier had successfully fought back two waves of enemy soldiers, survived the mortar attack, watched three friends die, and carried another wounded comrade to safety. Each time the enemy had come Pete Lemon had fought with fury, determined that if he could survive this assault, the worst would be over. Wounded a second time, when a third wave appeared poised to overrun the perimeter it seemed that all hope for survival was lost. Determined to go down fighting, however, the intrepid soldier found a working machine gun and jumped to the top of the berm (dirt pile surrounding the base camp) and, in a fully exposed position, continued to fire at the enemy. Wounded yet a third time in that final assault, and reduced to having to fend off the enemy in hand-to-hand combat, somehow the fearless Army Ranger survived the night. In the days that followed he surveyed the impact of that night from his hospital bed. Every man in the platoon had been wounded. Dead were three of his closest friends, Casey Waller, Nathan Mann and Brent Street. His own wounds would require more than a month of hospitalization, yet he had refused to be evacuated until the other wounded had been flown to a field hospital. Peter Lemon’s war was over and within six months he had returned to his hometown in the state of Michigan as a civilian to try and forget an event that would forever haunt his dreams. 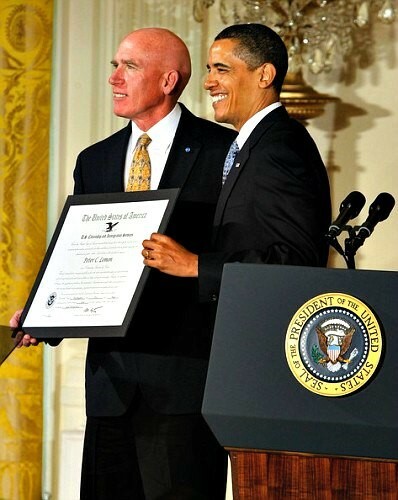 When word arrived the following spring that President Nixon would present the Medal of Honor to him at the White House, Pete Lemon seriously considered turning down the award. There had been eighteen heroes on his section of the perimeter that night, three of whom had died. The Medal, if there was to be one, belonged to them, not to Pete Lemon. Eventually, the Army prevailed upon the young man from Michigan to accept his Country’s highest award. 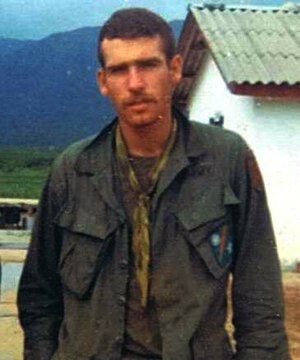 Ten days after his 21st birthday President Nixon greeted him at the White House and proclaimed him a “hero.” Pete Lemon, who had become a naturalized U.S. citizen at the age of twelve, was the only Canadian-born Medal of Honor recipient of the Vietnam War and the first since World War II. It was not a role he had either sought or desired. Shortly after receiving the award he moved to the Rocky Mountains of Colorado. There he returned to college where he received Bachelors and Masters Degrees, and quietly built several successful businesses. Few people, including his closest friends from his college days or even his next-door neighbors, knew that Peter Lemon was a recipient of the Medal of Honor. One of Pete’s fellow Medal of Honor recipients had once said, “It’s easier to earn the Medal than to wear it.” Pete didn’t even try. But while he shunned public recognition of his military heroism, he never forgot the men who had been with him on that night. The survivors of the April Fools Day assault on FSB Illingworth had tried to stay in touch through the years, attempted to support each other through the tough times of “survivor’s guilt” and “what if?” questions. While visiting by phone with one of those comrades one night almost thirteen years after his moment of valor, Pete was asked about his Medal of Honor. “Oh, I have it,” Pete Replied. “Where is it?” asked his friend. “This book ought to be in every school,” said a young student shortly after the release of Beyond the Medal. That student had used the book for a report in his own school. Other students wrote to Pete after reading his book, many of them echoing the same thought. That same year the Rotary Club in Pueblo, Colorado had a similar idea and purchased autographed copies for every school in the city and county’s two districts. As Pete Lemon pondered these things and remembered his own definition of a “Good Soldier” and his present role as a “Citizen Soldier,” a new mission developed. For more than a year he began to lay the groundwork for that mission, the dream of putting the words of yesterday’s greatest heroes in hands of tomorrow’s heroes. True to his mission, his hard work and sacrifice are now paying off. Early in October 1999, a special new printing of Beyond the Medal is being mailed to every middle school and high school in our Nation, more than 32,000 of them. With the humility that characterizes our greatest heroes, Pete would be quick to give the credit for the success of this new mission to the sponsors of the program which includes the Castle Rock Foundation, Fulcrum Publishing, The Military Order of the Purple Heart (Fountain, CO), the Congressional Medal of Honor Society, and other anonymous supporters. As one of Pete’s closest friends, I know all too well how many hours he has sacrificed and the money he has invested personally, to accomplish the mission for which he so quickly gives others credit. Some things just never change! Today Pete Lemon is the proud father of 3 children and works as a professional speaker for corporations and associations, and volunteers his free time to schools, veterans groups, and other organizations. 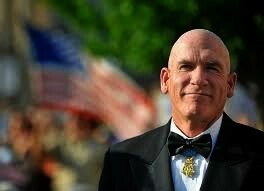 It has taken 25 years from the date of his award for him to learn to become a Medal of Honor Recipient. Is he finally comfortable with it? Not really. The Medal he wears still belongs to other men in his own heart and mind. It is for them that he accepts his role and accomplishes his newest mission, hoping that when others see the five-pointed star hanging from its ribbon of blue around his neck that they will look beyond the Medal and see the man. Together We Served is pleased to feature one of our Association Partners, the 3rd Marine Division Association. Since its conception in 1775, The United States Marine Corps has set the standard for America’s fighting forces. There is a pride and loyalty among Marines that cannot be be matched by any other organization in the world. From Bougainville to the DMZ, in war and in peacetime, the men of The Third Marine Division have been an essential part of the Marine Corps, serving their country with unyielding dedication and sacrifice. There is no such thing as an ex-Marine. Once you have earned the title, it becomes part of you forever. The Third Marine Division Association is committed to keeping this brotherhood alive. We are an exclusive organization. Only those who have honorably served with or were attached in support of The Third Marine Division are eligible to be members. Associate membership is open to those who are legal dependents, parents, or spouses of those persons living and deceased who are, or were, eligible for regular membership. Memberships: If you qualify and are not yet a member, click the red button below to get an application form, print the form, fill it out, and send it to the address on the bottom. Stevenson served in the Navy as a Corpsman, sometimes listed as Pharmacist’s Mate, then went to Northwestern University’s to study drama. Instead of heading to Hollywood, however, Stevenson remained in Illinois, selling insurance and working as an assistant athletics director at his alma mater. He also worked on cousin Adlai Stevenson’s failed presidential candidacies in 1952 and 1956 as a press agent. Stevenson later enrolling at the American Musical and Dramatic Academy, in New York City, where Lee Strasberg and Sandy Meisner were instructors. During World War I, one main problem for the Allies was the Germans’ ability to listen in on their telephone lines and to break their codes, which were generally based on either European languages or mathematical progressions. An apocryphal story spread around that a German once interrupted a U.S. Signal Corps member sending a message to taunt his use of code words. Sending out human runners proved equally ineffective since about one in four were captured or killed. And other methods of communications, such as color-coded rockets, electronic buzzers, and carrier pigeons, were too limiting, too slow, too unreliable or a combination thereof. 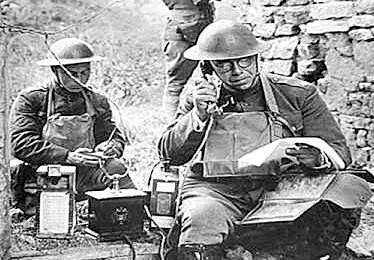 German intelligence monitoring Allied radios and telephone messages resulted in many lost battles and very heavy casualties. Concerned they war may be lost to the Germans, Allied commanding generals were constantly pushing their signal people to find a solution. Some progress was made but not enough to stop everyday losses. But it wasn’t until early 1918 that a solution was stumbled upon by chance. When Col. A. W. Bloor, U.S. Army, noticed a number of American Indians serving with him in the 142nd Infantry in France. Overhearing two Choctaw Native Americans speaking with each another in their native language, he realized he could not understand them. He also realized that if he could not understand them, the same would be true for Germans, no matter how good their English skills. Besides, many Native American languages have never been written down. With the active cooperation of his Choctaw soldiers, he tested and deployed a code, using the Choctaw language in place of regular military code. The Choctaw soldiers were incredibly gracious and willing to share their own language. They didn’t have to but they did. They had something unique and were incredibly proud of that. Two American Native officers were selected to supervise a communications system staffed by 19 Choctaw code talkers. The team transmitted messages relating to troop movements and their own tactical plans in their native tongue. Lacking the words for certain modern-day military terms, they used “big gun” for artillery, “little gun shoot fast” for machine gun, “stone” for grenade and “scalps” for casualties, among other substitutions, thereby becoming true code talkers rather than simply communications operators speaking a little-known language. Ironically, the Choctaw language was under pressure back in America. It was a time of cultural assimilation. Government attempts to ‘civilize’ American Indians involved putting their children in state-run boarding schools, where they were often severely punished for speaking in their native tongue. On the battlefields of France, the Native American language was the much-needed answer to a very big problem. Like other tribes, the Choctaw’s whole way of life was under threat. Little more than a generation before, they had been forcibly removed from their ancestral land. Under the 1830 Indian Removal Act, they were marched from areas around Mississippi to what is now Oklahoma. It is known as the ‘Trail of Tears.’ It is estimated 12,000 Choctaw moved where 2,500 died of hunger, disease, and exhaustion. In the autumn of 1918, U.S. troops were involved in the Meuse-Argonne Offensive on the Western Front. Within hours, eight Choctaw speakers had been dispatched to strategic positions. They were instrumental in helping U.S. troops win several key battles. Even if the Germans were listening, they couldn’t understand. It was also the quickest way of coding and decoding information, faster than any machine, giving U.S. troops a crucial edge over the enemy. On October 8, 1918, Oklahombi was at St. Etienne, France. According to some reports, he and 23 other soldiers attacked an enemy position and captured 171 Germans while killing some 79 more. They held their position for four days while under attack. Oklahombi was awarded the Silver Star with Victory Ribbon, and the Croix de Guerre from France’s Marshal Henri-Philippe Petain. At the time the members of the Choctaw nation were not formally U.S. citizens. Oklahombi was married and had a son. He was killed on April 13, 1960, when hit by a truck while walking along a road. He was buried with military honors at Yashau Cemetery in Broken Bow, Oklahoma. All of the telephone squad returned home to their families. For decades, their role in code talking was barely known outside the tribe and their efforts went unrecognized. In some cases, their own wives and families knew very little. Native Americans did not receive nationwide citizenship until 1924, yet the Choctaws were both patriotic and valiant, with a desire to serve in the war effort. Many Choctaw code talkers were instrumental in ending the war. Choctaw and other Tribal Nation served with distinction using Native languages in World War II, Korea, and Vietnam. In 1989 the French Government bestowed the Chevalier de L’Ordre National du Merite (Knight of the Order of National Merit) posthumously to the Choctaw code talkers of WWI and the Comanche and Navajo code talkers of WWII. But it was only in 2008 that the Code Talkers Recognition Act was passed in the U.S. Senate recognizing the hundreds of overlooked code talkers from different tribes, including the Choctaw. Each tribal government received Congressional Gold Medals, America’s highest civilian honor. They were inscribed with a unique design to represent their tribe. The families of each code talker received a silver version of the gold medal. Among these brave warriors were the famed Wind Talkers of the Navajo Tribe in World War II, who were deserving of the Gold Medal they received from Congress in the year 2000. The legislation was passed in both the U.S. House of Representatives and the U.S. Senate to award the Choctaw, Comanche and other Indian soldiers who were Code Talkers a Gold Medal. Support and co-sponsorship were requested of all of the Congress. The law was signed in 2008 by the President. 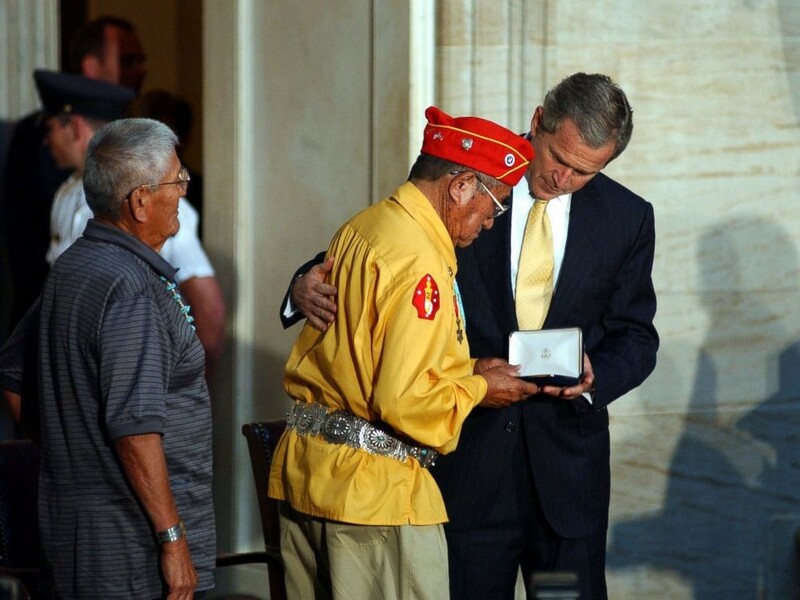 “Honoring Native American code talkers is long overdue,” the bill admitted. Pursuant to the legislation, a medal ceremony took place in November 2013 in Washington, D.C., with 33 tribes known to have had code-talking members in attendance. It was a bittersweet moment. None of the original code talkers alive from the Choctaw nation to see this moment and none of their children were alive. But it was also an incredible moment. Those men deserved to be honored. Short Bio: An all-round performer, he could sing, act, dance and make people laugh with his many impersonations. Davis’s long career in show business was even more remarkable because he managed to overcome racial barriers, in an era of strict segregation and racism. Davis was drafted into the US Army when was eighteen and his experiences were not happy ones. Photo is of Davis entertaining the troops in Vietnam in 1972.